Video Poker Basics : Play this card game online! The video poker basics outlined here will demonstrate how this popular online activity is very similar to slots. When you play this card game online you are in for an incredible experience that matches that found in brick and mortar casinos. Since both locations--online or physical--involve the use of a software system, they are more alike than different. A random number generator determines the results in this activity. However, there are some tips you can follow to help yourself make better decisions and moves that can have a positive impact on your bankroll. All aspects of the game do not have to be based fully on chance. The internet version is still founded on the principles of the traditional 5-card draw method. Nevertheless, some newer internet gamblers find themselves overwhelmed and a bit disconcerted when trying out this activity over the web for the first several times, but it certainly doesn't have to be that way. As long as you acquaint yourself with the different buttons and functions utilized during play so that you are not "feeling" your way around when involved in an actual game, you'll be ultimately successful. Many sites with video poker allow users to practice on a few rounds before they wager real cash. Take advantage of such opportunities to learn the ropes. After getting accustomed to the internet system, controls, and instructions, other video poker basics include figuring out a particular approach you will take during play. Since you are able to examine a hand and decide which cards you want to keep or discard, a rule of thumb is to hang on to those Aces or face cards and get rid of all the other less promising ones. Still, even this strategy will be dependent on the hand you get so always familiarize yourself with the payout chart and know which combinations win the most money. For the newbies out there, many sites allow a feature that makes this decision for you. Still, if you are going to take the activity seriously, you want to develop a strategy for yourself. Then, you can visit Vegas Palms Casino for the best games today! There are lots of variations to the standard version of online video poker and below we list some of the most popular games and a brief overview of each. Tens or Better: This online video poker variation pays out winnings on pairs of tens and is very similar to Jacks or Better in terms of gameplay and strategy. 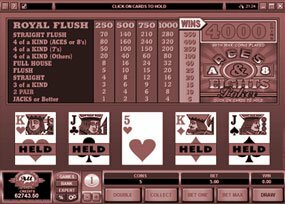 Deuces Wild: This video poker variation features wild cards and is very popular with casino players. In this game, deuces are wild and can be used to help you make a winning hand. There are a number of pay tables available too depending on the software provider so again check before you play. Aces and Eight: This is another variant of the Jacks or Better game and gives you a bonus for four of a kind of Aces and Eights. When played with a full payout table this video poker variation can give you an RTP of 99.78%. It is played in exactly the same way as Jacks or Better. Double Bonus: Another Jacks of Better variation this game offers a bonus payout for four Aces. It has a theoretical RTP of 100.2%. There are a number of pay tables so check before you play as this will make a difference to the amounts you can win. 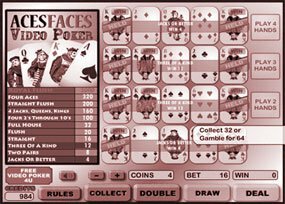 Aces and Faces: In this casino card game you get bonus payouts when you get four of a kind on an Ace or a face card. Face cards are Jack, Queen, and King. Video poker offers some of the best odds when it comes to online casino games and is a great alternative to online slots. You get a chance to win big, but even more than that, you are about five times more likely to win. Of course, if you do want to be in with the chance of winning big you will want to know what you're doing and this is where learning the poker strategy comes in. There are betting options for all budget types and in all the games you can bet from one to five coins. You will see this reflected in the payout table which has five columns and shows the amount you will win depending on how many coins you are betting. There is normally a bonus for the Royal Flush too and this is the big jackpot prize. The number of coins you bet is important here as it increases the jackpot exponentially and if you are playing a progressive jackpot title you have to bet the maximum number of coins to activate it. You should always play five coins if you can. In all video poker games, you are dealt five cards and it is up to you to decide which ones to keep. You then hit the draw button to get replacement cards for the one you discard. You win if you match any of the hands on the payout table. If you're new to video poker we highly recommend playing free video poker games for practice and to learn about the different game variations. If you want to play for real money right away check out http://www.online-casinos.ca/playolg-casino-canada.html. Video Poker is easy to play and to help you increase your chances of winning, here are our top tips and strategies. Know the types of games: Different video poker variations have different pay tables so you want to choose the one that is most appealing. It doesn't matter whether this is Deuces Wild, Jacks or Better, or Double Bonus poker, knowing what games are available is the first thing you need to look at. Play the Maximum Number of Coins: Most video poker games offer you a bonus amount for wins while playing the maximum number of coins. If you want to get more out of your money this is worth remembering. Make a Budget and Stick to It: Before you sit down to play any video poker games, be sure to have a budget in place and stick to it. It's very easy to spend more than you intended. We all want to win but we all lose at times too. If you make a budget and stick to it, you won't overspend. Make Wise Decisions: Look at the cards your dealt and think about the decisions you make. This will pay off in the long run. Check the Pay Tables: Some games have better payouts so find the ones that are more profitable for you. Know the Strategy for the Game you are playing: It is important to know what to do based on every hand you are dealt and this will change depending on the video poker game you are playing. Play for Free: Practicing for free before you play for real money is always a good idea. You can try out new variations, test out a strategy, and more.